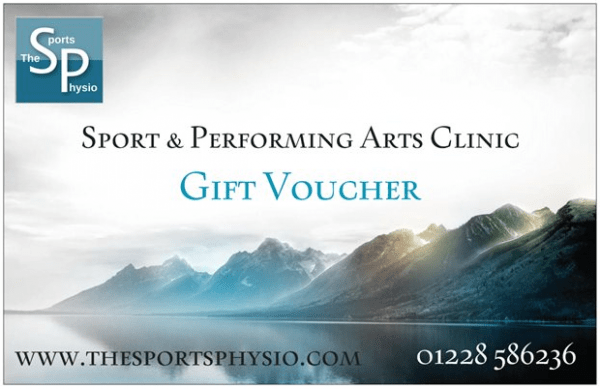 Gift vouchers for our Sport and Performing Arts Clinic make a great Christmas or birthday present for a friend or relative. Choosing an ideal gift is the annual challenge, so why not try something different and give a Sport and Performing Arts Clinic gift voucher. Available in a number of values, vouchers make an ideal, value for money, easy Christmas or birthday gift. You do not have to be injured to take advantage of the services at our Sport and Performing Arts Clinic. A simple 30 minute massage treatment can relieve day to day stress and strain, whilst also giving the opportunity to relax. Situated to the east of Carlisle, in the rural village of Warwick Bridge, we have been trading for over 13 years, specialising in musculoskeletal problems. Manual techniques remain at the forefront of our treatments, so you will not just be sent away with exercise leaflet. For the ultimate in easy Christmas or birthday gifts, our vouchers are even available via our secure online shop. We will pop them in the post and take the hassle out of your present shopping. Postal vouchers will be sent via first class Royal Mail and our vouchers are valid for three months from the date of purchase. Treatment sessions usually last around thirty minutes to an hour depending on the service chosen. Vouchers have no cash value and can only be redeemed against treatments and assessments at the Sport and Performing Arts Injury Clinic Carlisle. They cannot be used against purchases from The Sportsphysio.com shop.